A new study suggests that non-native worms are eating up the forest floor, causing sugar maples to die back and perhaps harming other forest dwellers. The worms crawl in, the worms crawl out, and corpses aren’t the only casualties. A Michigan Technological University scientist has fingered non-native earthworms as a primary culprit in the decline of an iconic American tree. Sugar maples are prized as much for their valuable lumber as for their sugary sap and dazzling fall colors. In Michigan alone, they are the basis of a multi-million-dollar industry. But several years ago, foresters began noticing that the crowns of the big trees appeared unhealthy, with bare limbs and little new growth. “They were losing trees before they could harvest them,” said Tara Bal, a research assistant professor of forest resources and environmental science. “We wondered what was causing it.” Her findings were published July 26, 2017, in the journal Biological Invasions. Drought was a suspect—the traditionally damp northern Great Lakes region was in the midst of a dry spell. Other potential causes were forest management practices, soil types, climate change and the mix of species in the area. From 2009 to 2012, Bal made annual visits to more than 100 sites in Michigan’s Upper Peninsula, northern Wisconsin and Minnesota. She found one factor that stood out: the condition of the forest floor. And nothing affects a forest floor quite like earthworms. 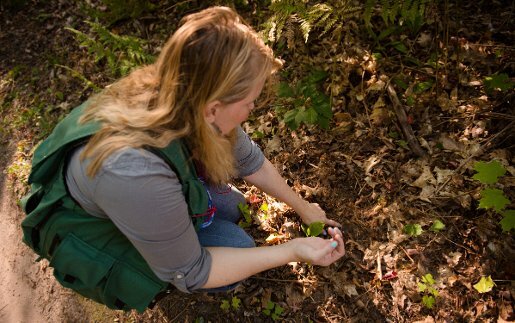 Tara Bal examines the forest floor for signs of earthworm damage. While they may seem as American as maple syrup, no earthworms—including the nightcrawler—are native to the Upper Midwest. If there ever were any, the last ice age wiped them out over 11,000 years ago. “All the earthworm species here are from Europe or Asia, brought in when humans transplanted plants,” Bal said. Now, they and their egg cases hitch rides on tires and muddy boots and spread when anglers dump bait in woods and waterways. “It’s the same way invasive plants get around,” she said. Sugar maples have a particular characteristic that makes them even more vulnerable to earthworms. Ninety percent of their roots are in the top few inches of soil, so the trees rely on the litter to keep the soil from drying out. With the litter gone, maples can slowly die of thirst. Maples aren’t the only victims of these wriggly invaders. Many other forest creatures depend on forest litter for their survival. “I was just looking at the health of the trees, but earthworms are really affecting the whole forest,” Bal said. “You lose wildflowers, young seedlings and many ferns.” The worms can reduce ground-nesting birds, insects, amphibians and fungi whose lives are intertwined with the forest litter. “I’ve never seen a salamander on the Michigan Tech Trails, but I’ve seen a lot of nightcrawlers,” she noted. That could mean a return to diversity; sugar maples did not always dominate northern hardwood forests. “We have pure maple stands because it’s a valuable wood,” she said. “If some of the sugar maple dies back, you could have the return of other species, like basswood, birches and ironwood. The study was conducted in the Hiawatha, Ottawa, Superior and Chequamegon-Nicolet National Forests; Baraga State Forest; and commercial forestland owned by the Boston-based investment firm GMO. Funding was provided by GMO and the USDA Forest Service—Forest Health Monitoring Program (Project NC-EM-B-10-02). The article on the study, “Evidence of Damage from Exotic Invasive Earthworm Activity Was Highly Correlated to Sugar Maple Dieback in the Upper Great Lakes Region,” was published July 26, 2017, in the journal Biological Invasions (doi.org/10.1007/s10530-017-1523-0). Coauthors are Bal, Professor Andrew Storer and Research Professor Marty Jurgensen, all of Michigan Tech’s School of Forest Resources and Environmental Science. Michigan Technological University is a public research university, home to more than 7,000 students from 60 countries around the world. Founded in 1885, the University offers more than 120 undergraduate and graduate degree programs in science, engineering and technology; forestry; business and economics; health professions; humanities; mathematics; and social sciences.